Won''t CO2 deprive the engine of Oxygen and stall the engine? Yes it will, but CO2 is NOT being introduced into the air stream. We are harnessing the cryogenic power of the CO2 to charge various heat sinks to cool the air and fuel charge. This does bring up an excellent pointÃƒÂ¢Ã¢â€šÂ¬Ã‚Â¦when venting the system you need to make certain the air intake is not picking up the venting CO2. The same is true if you''re using the Intercooler Sprayer. Make certain the air intake is away from the intercooler or it could stall the motor. Air Intake Chamber and Fuel Bars come complete with connection/venting hose. This hose either connects to the next component or enables you to decide where you want CO2 to exit. Yes, we have not found a limit to the number of components that can be charged at one time. 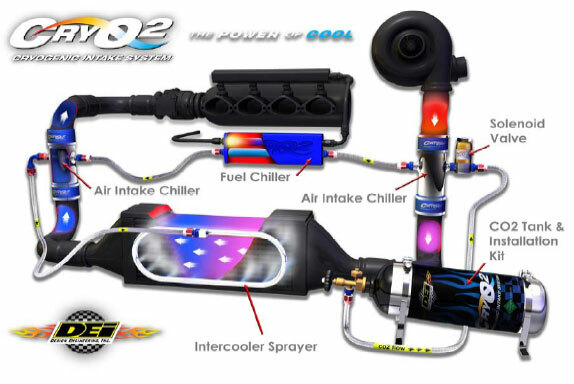 To use multiple Intercooler Sprayers a Â fitting and additional hoses will be needed. Some of the Turbo crowd has had great success using multiple Air Intake Chambers. Use one before the turbo, one between the turbo and intercooler and one after the intercooler before the throttle body. They can still go to a fuel bar (or two, or three, etc.) and finally to the Intercooler Sprayer. The CryO2 system is designed to be universal in nature. The Air Intake Chamber comes in diameters of 2.5ÃƒÂ¢Ã¢â€šÂ¬Ã‚Â and 3ÃƒÂ¢Ã¢â€šÂ¬Ã‚ÂOD to match your air intake tube. Reducers or expander sleeves can be purchased to make it fit properly. DEI does offer a CryO2 Intake Bulb along with its connecting threatened legs separately (no hoses included with PN # 080119) for custom applications that are over 3 in diameter. The Fuel Bars simply fits pre-fuel rail with your fuel system attaching anywhere on your fuel line that you are able to fit it. Fuel Bars are available with either -6AN or -10AN sizes. Fuel Bars have 2 female openings in the selected size, one at each end. You will need to buy fuel fittings to complete the installation. There were just too many options and applications to provide fittings for every vehicle on the road. The Intercooler Sprayer is universal; simply find the size that best fits the surface of your intercooler and mount it on. That is a tricky question because of the many variables involved in the physics of the system - base horsepower, altitude, ambient air temp, humidity, intake system, MASS airflow sensor and intercooler efficiency can all affect the performance of the system. We tested a naturally aspirated Honda Civic with 110base HP on an 85 day with 72% humidity using just one Air Intake Chamber and found a 9% increase in horsepower. In this example we saw an intake temperature of 38 and that is just with an Air Intake Chamber. Other tests have produced horsepower increases in excess of 40 degress plus from heat soaked conditions utilizing our cryogenic components. What racer couldn''t use an extra 40 horsepower. Think about how your car performs on a nice cool fall morningÃƒÂ¢Ã¢â€šÂ¬Ã‚Â¦it feels more responsive and powerful. As the engine heats up it loses horsepower and becomes a little sluggishÃƒÂ¢Ã¢â€šÂ¬Ã‚Â¦What we have created is a way to give you that cool fall morning on demand and eliminate power robbing heat soak!! QUESTION: I got a '99 new beetle 1.8T we race,whaat I badly need is a cry02 sprayer 8"x6" with the piping(hose),necessary pump,swith,mounting hardware to the IC front & a spare tank.If this complete enough & makes sense pls. let me know the price tag plus any suggestion,info & advice.Thanks.giorgio.